One of the best kept secrets in Courtenay is the actual place you go to get information about the best kept secrets in Courtenay and the entire island! 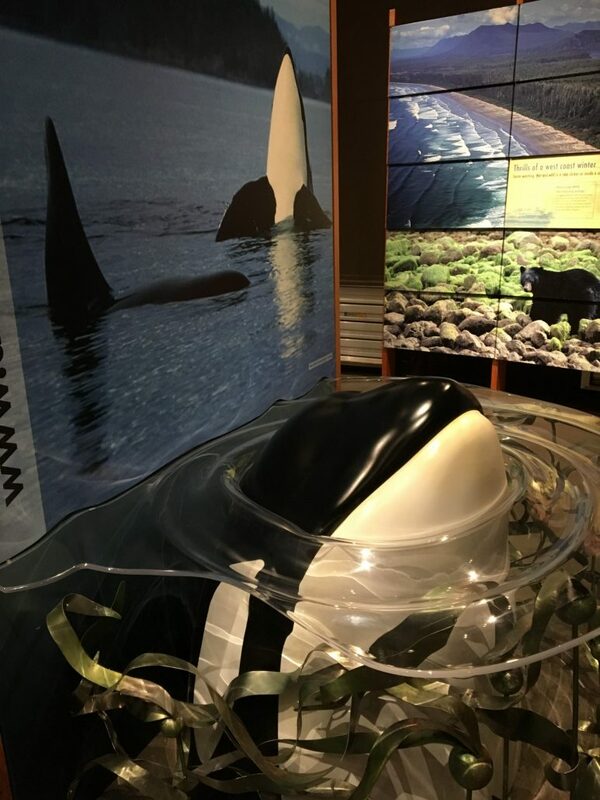 The The Vancouver Island Visitor Centre, just off Route 19 and Comox Valley Parkway, might have been more aptly named “The Vancouver Island Experience” because it’s an attraction in itself. From the road, this circular building with a grass-covered roof topped with an eye-catching airplane is a fantastic advertisement for the Centre. Once inside, you’ll want to head straight into the interpretive centre. Any one loving “selfies” will enjoy the opportunity to sit on a mountain bike or chairlift seat, all set against realistic backdrops, as though you were really biking or skiing. Even a segment of a kayak puts you right on the water. Kids love climbing into the center of a large fir trunk to owlishly peer out of a hole at the guests below. I recall my first time visiting here and messaging the images I’d taken to my stateside family, inviting them to hurry up and visit. On a more interactive level, videos, photographs, graphics and First Nations Art provide tons of information and inspire conversation. 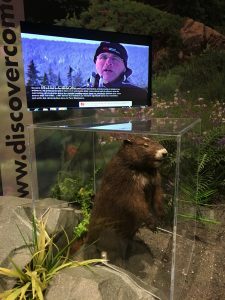 I love the Vancouver Island marmot exhibit, as this is one of my favorite animals, now endangered, but on the conservation radar of our residents. 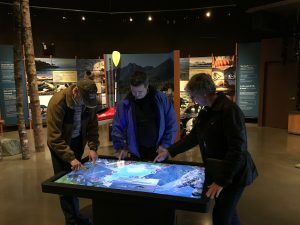 I had the opportunity to observe a couple new in the area who were visiting with their family whose favourite attraction was the interactive map, (pictured above) strategically placed within the center’s core presentation area. The size of a foosball table, you can call manipulate compelling images and information. The topographical map also is aa hit and shouldn’t be missed. But that’s not all. The retail shop is stocked with unique, locally-made products. I am going to go for the First Nations inspired tea and tea tins next time I’m shopping for gifts. Also, the board room makes for great meeting space. At the end of the day, every information centre needs to share information. The racks of brochures and booklets are full and easy to peruse. Even the selection of natural history and children’s books is super compelling, I had to grab a few and scan them while sitting in reading nook, complete with a fireplace. A good centre also needs friendly staff, and the people there were welcoming. Had there been a bigger food outlet, I would have stayed longer! I am hoping the signage off Route 19 will get better as one is likely to overshoot it or undershoot it driving in any direction. The entrance is quite south of the actual building and you’ll be looking for Small Road . If you haven’t visited lately or at all, head on over, it’s just minutes from the Old House and likely en route to any of your planned adventures!